The Account Performance window displays performance data in a variety of ways. Displays all performance statistics and metrics. Please see the Statistic Definition section of the help guide for details on how each statistic is calculated. Displays data based on various time periods for analysis. Analysis view displays both a grid of data in the selected period format and a graph that you choose to display based on the period data. It allows an easy way to see trends in the data set and make correlations. The period grid has options that let you select what data to display, note that the data in the grid drives the data shown in the selected graph type below. Sets the periodicity you want the trade data displayed in, this also drives the graph below. Note: Half-hour of day, Hour of day, and Day of week are distribution period selections, meaning that the trades that make up the collection will not be in synchronous order, therefore cumulative statistics such as Cumulative Net Profit are disabled. 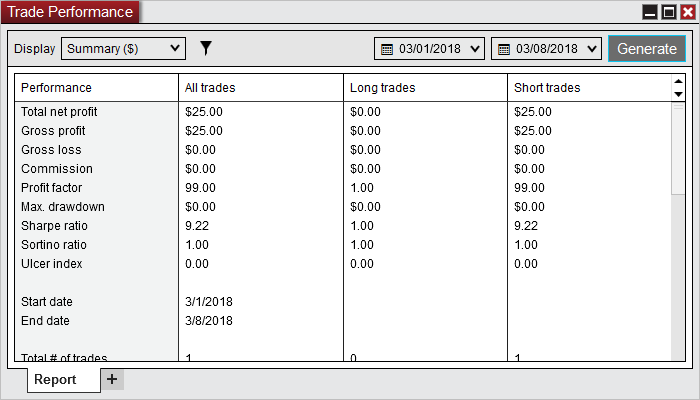 Sets if you just want long trades displayed or short trades displayed. Sets if you want only trades that have a Net Profit greater than 0 displayed or less than or equal to 0. Sets if you want to include the the trade in the period based on the entry time or the exit time of the trade. Tip: Selecting a graph row will highlight the row and also highlight the data point that is associated to this data on the graph below. The graph displays data from the period grid above. You can select what data you would like to view from the Graph selection combo box. As you move your mouse over the Graph a dot will be displayed indicating that it is a data point. Left clicking on the data point will select it and also select the same data in the Period Grid above the Graph. Please see the Statistic Definition section of the help guide for details on how each graph type is calculated. Note: Some graph types are not available for some period types, in this case the graph type will be disabled. The Executions display shows all historical executions in a data grid. The columns listed in the data grid use the same layout you would see from the Executions Tab of the Control Center. For definitions of each column, please see the Understanding the executions tab section. 2.Right mouse click and select the menu item Chart. There may be situations where you will want to manually add or remove an historical execution. Historical executions are used to generate performance data in the Account Performance window. If an execution is missing, the performance data will be incorrect. This could happen since not all brokers provide historical execution. Let's say you placed a good till cancelled (GTC) order on Monday, did not connect on Tuesday at which time your order filled, then connected NinjaTrader on Wednesday, NinjaTrader would never receive the execution report for Tuesday's order fill. You would then have to add this historical execution to the database if you want your performance reporting to be accurate. 1.Right mouse click in the Executions display and select the Add... menu item. The Add Execution window appears. The execution is now added to the database and will be used in performance reporting. You can also remove an execution by right mouse clicking the execution you wish to delete and selecting "Remove". The Trades display shows all historical executions in a data grid. A Trade defined is a completed buy/sell or sell/buy transaction sorted by time and matched by the market position and quantity of the execution. Positions which have been scaled in or scaled out will be considered as separate trades. NinjaTrader will open a temporary chart to the location of the trade. The Orders display shows all historical orders in a data grid. The Journal tab is only visible in the Account Performance window. 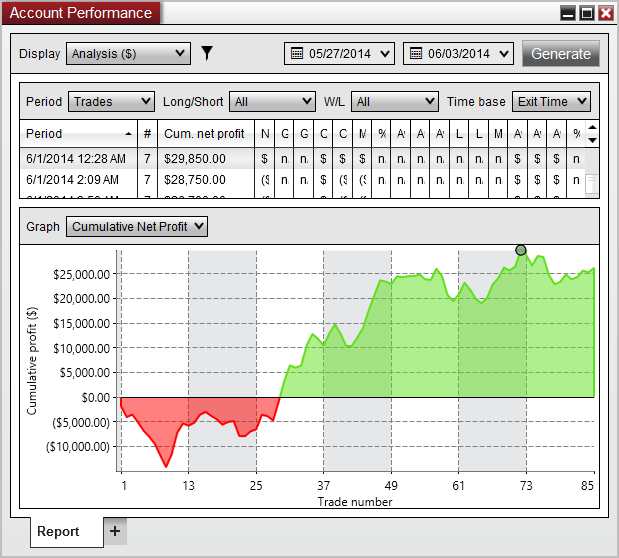 The Journal tab allows you to keep journal entries on your trading activities. Enter your comments in the text area and press "add". The data grid will display your journal entries by date. Tip: You can also add Journal entries based on a Execution or Trade via the Executions Display and Trades Display. Right click on an execution and select "Add Journal Entry".